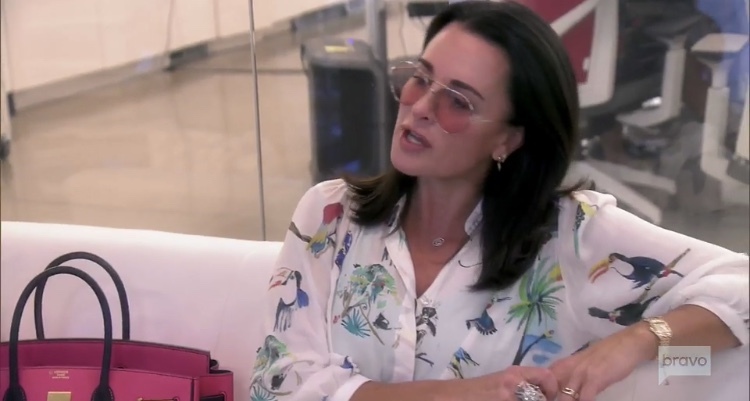 Kyle Richards Says Text Printouts Lisa Vanderpump Showed Her Excluded Parts That "Implicate Lisa"
Real Housewives of Beverly Hills star Kyle Richards keeps insisting that she doesn’t want to take sides between Lisa Vanderpump and Teddi Mellencamp Arroyave. She must have forgotten that actions speak louder than words. Kyle repeatedly tried to get Lisa to talk about puppygate even when she didn’t want to. She also manipulated advised Teddi to think of what Lisa’s next move would be. It’s pretty clear that Kyle has picked a side and it’s not her best friend Lisa’s. And if Lisa won’t talk about puppygate, Kyle will. In her Bravo blog, Kyle explained her thoughts on puppygate and what happened. Regarding if her new BFF Teddi had her hands clean or not, she said, “I knew Teddi had some part in all of this, because she told me everything after that day at Vanderpump Dogs.” The way Teddi rants about things that conversation must have lasted for hours! She continued, “She also showed me ALL of the texts in her phone between her and John Blizzard.” So, this means that when they were all in the Bahamas and Teddi claimed she doesn’t lie, Kyle sat there complicit knowing that Teddi was lying to everyone. The texts clearly showed that Teddi was in on the setup. They deserve each other. Kyle then explained why she and Teddi didn’t seem so upset about what happened to Lucy when they were at Vanderpump Dogs. She wrote, “The story we later heard was very different from the one we were originally told by the Vanderpump Dog’s team. Which may explain why we were less upset later than we originally were.” The reason why they were “less upset” is because they are bad actors. This whole thing was never about the dog, but about a storyline to take down Lisa. She added, “Remember, that day at Vanderpump Dogs, I was initially confused as to why Lisa V was not upset with Dorit [Kemsley] about the dog. It seemed this information was given to Teddi and then me with the hopes of going after Dorit.” So Lisa was not only manipulating Teddi, but now Kyle as well? Makes sense since Lisa has so much free time and all. It would have been too easy for Kyle to say what the missing texts were to Lisa right then and there. Then we could be done with this nonsense. But, Kyle doesn’t like to pick sides. Ever. We’re going to have to wait all season long for the smoking gun. Yippee. TELL US – DO YOU THINK LISA WAS MANIPULATING TEDDI AND KYLE TO GO AFTER DORIT? WHY DO YOU THINK KYLE SIDED WITH TEDDI OVER LISA?